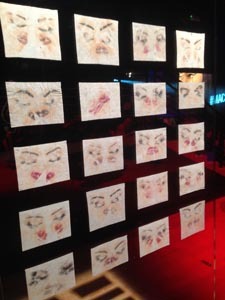 I wanted to write this post while memories were fresh and my feeling of elation was still high after was a truly memorable evening of fun music, visual treats and fantastic company. 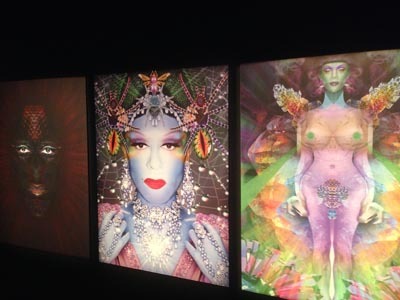 The Electric Ballroom in Candem was cleverly transformed into an alternative performance and entertainment space thanks to eye catching art installations, costume displays and clever use of projections and lighting. Set wise, I loved the big head of Joey on Stage, this created a great focal point and much to talk about. Dotted around the room where some great art installations and costume displays. 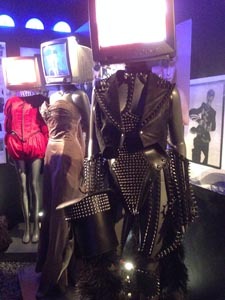 The costumes displayed were once used by Joey in her now iconic performances, clever videos on top of the mannequins showed each costume during the performances. The videos around the room added greatly to the atmosphere and rightly hinted to what was later to come. The details did not stop in the decoration as the most trendy of DJs kept the vive going while handsome waiters served delicious cocktails throughout the evening. To add to the already fabulous evening, the famous Joey Arias performed three sets of solo singing with her wonderful velvety voice later joined by two other amazing performers also all the way from NY. The vive was great, the crowd amazing, the music memorable, the installations fun and unique... what more could we have asked for? Thank you to all involved and thank you for letting us being part of what was a truly memorable evening.